Last night I had the great honor and distinct privilege, as President of the State Bar of Georgia, to recognize Judge Carla Wong McMillian, recently appointed by Governor Nathan Deal, as the first Asian Pacific American state appellate judge in the Southeast. This was an historic appointment by Governor Deal and the State Bar of Georgia salutes him, as well, in breaking this barrier for Asian Pacific Americans. I was proud to stand with the Honorable Al Wong, Judge, State Court of DeKalb County and the very first Asian Pacific American state court judge in Georgia, to recognize this nod to the need for vigilance and diversity. On behalf of the State Bar of Georgia, it is my pleasure to welcome you to the Bar Center this evening, and to thank the Georgia Asian Pacific American Bar Association for co-sponsoring this reception. 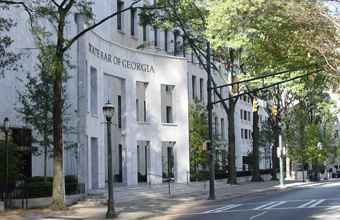 Judge Carla Wong McMillian is most deserving of her appointment by Governor Nathan Deal to serve on the Georgia Court of Appeals, considering her 14 years in the legal profession, including her exemplary service as a trial judge in the Fayette County State Court. A native Georgian born and raised in Augusta, Judge McMillian was the valedictorian of her high school class and graduated with high honors from Duke University, earning degrees in both History and Economics. She graduated third in her class from the University of Georgia Law School, where she was a Woodruff Scholar and served as president of the Christian Legal Society. Judge McMillian began her legal career as a federal law clerk for Judge William C. O’Kelley of the U.S. District Court for the Northern District of Georgia. She later joined Sutherland Asbill & Brennan LLP, where she became a partner in the litigation group. Her practice centered on complex business litigation, including a heavy emphasis on and experience in appellate matters. Judge McMillian is a frequent speaker on professionalism in the Bar and a mentor for younger lawyers and law students on professionalism issues. She promotes the highest ideals of the legal profession to younger students as well by speaking at local school events, hosting student groups who visit the courthouse and serving as a mock trial competition judge. We are not only congratulating Judge McMillian this evening. We also salute and thank Governor Deal for making this historic appointment of the first Asian Pacific American state appellate judge ever in the Southeast. As I said when I took office as only the second female president of the State Bar of Georgia, diversity of leadership is, in my opinion, a key to the ongoing health and strength of any organization, the justice system included. Diversity allows all points of view to be heard and considered. It makes one stop and reconsider the framework through which you view all issues and makes you actually take a minute and put yourself in someone else’s shoes before reaching any decision. Each time a barrier is removed in the leadership of our courts, a door opens to a new generation of potential judges, which might include the next Thurgood Marshall, the next Sandra Day O’Connor, the next Robert Benham, the next Leah Ward Sears or the next Carla Wong McMillian. And that is something to be celebrated. Accepting Governor Deal’s appointment to the Court of Appeals further confirms Judge McMillian’s status as a real trailblazer in Georgia’s justice system. She was the first minority woman elected countywide to any office in Fayette County’s history, as well as being the first Asian American female judge to be elected in Georgia. It is no wonder, then, that she has received such honors as one of the nation’s “Best Lawyers under 40” by the National Asian Pacific American Bar Association in 2012 and as one of the “Most Powerful and Influential Women in Georgia” by the National Diversity Council in 2010. Judge McMillian’s acceptance of this nomination is further proof of her status as a trailblazer in Georgia’s justice system. It also demonstrates her continued commitment to public service, which in turn serves to promote the cause of justice, uphold the rule of law and protect the rights of all citizens. The State Bar of Georgia enjoys a great working relationship with the Court of Appeals, which we look forward to continuing with Judge McMillian for many years to come. Please join me in congratulating our newest judge on the Georgia Court of Appeals, Judge Carla Wong McMillian.